The study of prehistoric life is at the forefront of life science studies, natural history museum interpretive programs, and popular culture, but there has never been any comprehensive overview of the evolutionary steps in any media. This remarkable poster fills that need. It contains a wealth of information and presents it in a very simple way, making it easy to understand. 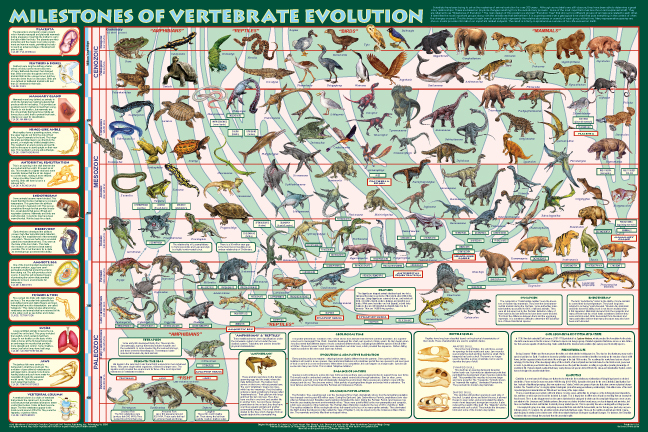 This exciting new poster provides a comprehensive overview of vertebrate evolution in accordance with the new cladistics system, which it introduces. The most important evolved characteristics are shown and explained as the "Milestones of Vertebrate Evolution." These provide the foundation for grouping similar animals together into clades." The main design is an "Evolution Tree," which is a stylized cladogram. It shows and identifies all of the major clades. The "tree" design shows how each branched off from earlier ones and other relationships. Each of the milestones is predominately marked on the tree as they are the basis for the most important clades.